You know that feeling you get when you go out to eat and hate almost everything on the menu? I have always been a picky eater, and I have a pro tip for you: chicken fingers are my holy grail (unless you’re vegetarian of course, in which tofu nuggets are great). I’ve always been a picky eater, so chances are I’m ordering chicken fingers almost any time I go out to a bar or restaurant. After my many travels as a chicken finger connoisseur, I've come up with a list of three bars and restaurants that have Toronto’s tastiest tenders! The atmosphere of this bar is amazing. Great music is always blasting, the drinks are delicious and the chicken fingers are of the highest stature. One day, I told my friend I was craving greasy pub fingers and we set off on a journey. We were in the downtown core and I had always wanted to try Duke’s, as it was recommended to me on countless occasions. I was not disappointed, to say the least. The menu describes the meal as “fresh, never frozen and breaded to order” and I believe it. The breading was so flavourful, and the chicken is so tender that the breading fell off of the meat completely. You can never go wrong with Fran’s. Or chicken fingers. 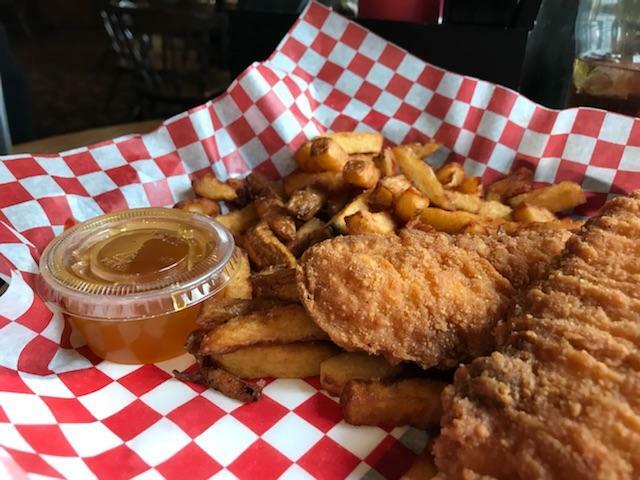 Fran’s serves up some classic deep-fried chicken fingers whose flavours are only amplified when dipped in tangy plum sauce. There’s also an option to have them tossed in different sauces such as barbeque, honey garlic, hot and extra hot, which are an awesome way to vamp up your meal!. Whatever your preferred eating approach, you’ll definitely be licking the plate clean. Last but not least, the ‘campus’ pub. Imperial is a great place to kick back after a long of day of lectures and labs. They’re known for offering up some of the best comfort food, such as burgers, nachos, fish and chips and much more. Their chicken fingers are the perfect amount of greasy that you’ll want to soak up after a long day. You can get them with golden-crisp fries or on a combo platter which also includes mozzarella sticks, onion rings, fries and a cheese quesadilla. You might want to bring a few friends to share with you if you’re going to opt for the platter, or eat it all on your own, no judgement here! All three of these restaurants are perfect spots to satisfy any fried chicken craving. With individual elements that make each place’s chicken fingers unique to their menu, it’s hard to pick just one to go to! I hope you give all three of these diners and pubs a try, you’ll thank me when you’re fighting the urge to lick your fingers after.